Good morning, my internet friends from around the world! I’m writing this on Tuesday, in my jammies, sipping hot coffee in my favorite mug. Life is good! 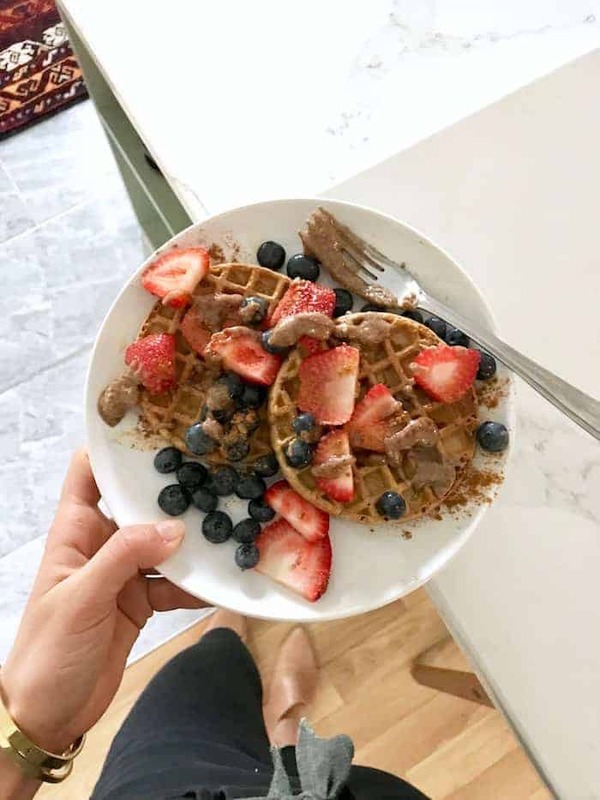 Two toasted Van’s multigrain waffles with almond butter, strawberries, bloobs, a drizzle of pure maple syrup, and a sprinkle of cinnamon. Plus a cup of coffee! I can’t get enough of this combo. Also how cute is my gold lightning cuff?? Leftovers for lunch are the BEST because lately I’ve been out of town on the weekends which means no time to make food for lunches. This was Aladdin’s Lebanesa salata with a giant scoop of mujadara lentils and rice on top plus baba ganoush and lemon olive oil dressing. Don’t skip the hot sauce! We got the most giant cantaloupe in our CSA so I’m always munching on that (love it cold right out of the fridge) throughout the day. Side note: as you can see, I eat lots of fruit. I always have! And I for sure eat added sugar (in moderation) every single day. I know the wellness world/instagram has a wacky way of making us fear fruit (along with other things), but this doesn’t come from a healthy place. Fruit is not only super delish, refreshing, and satisfying, but it’s also packed with disease-fighting phytonutrients you can’t get elsewhere. Yes, a smoothie with three bananas followed by a mountain of blueberries isn’t ideal for blood sugar, but most people aren’t consuming that amount. If you fear fruit, you likely have a larger issue with sugar in general. In order to repair that, you have to get comfortable with sugar and eat it daily so it loses its luster versus restricting it and feeling out of control and anxious whenever you see it. I encourage you to read Intuitive Eating as a starting point if this is speaking to you. I do not believe in food addiction. When people claim sugar lights up the same regions of the brain as cocaine, that’s not the full picture. That’s sensationalizing research, and most people don’t have the time nor desire time to dig into the actual evidence. My food friend Robyn points out in her blog post on sugar addiction that in the studies done on rats, this only happens under forced deprivation, AKA dieting. Under deprivation and restriction, a person’s reward response is heightened. Rant end! Loving FAGE 2% in the blueberry flavor for an afternoon pick me up. Blue Apron to the rescue after a weekend away! 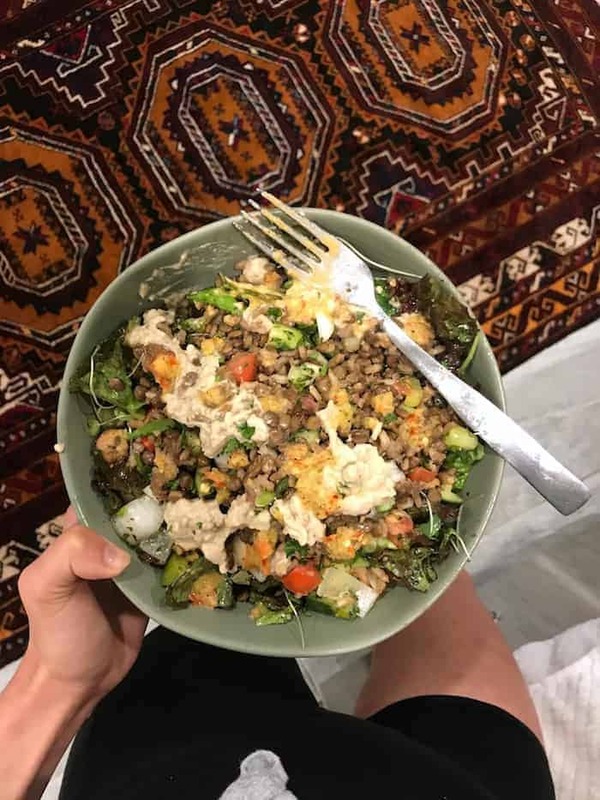 I made their Wild Alaskan Pollack with Summer Vegetable Salad and Olive Tapenade and we absolutely loved it. I’ll be posting the entire recipe plus a coupon code next week so stay tuned! On the side we had steamed green beans from our CSA that I tossed in a little butter, garlic powder, kosher salt, and pepper. Peaches n’ cream! More like the most fabulously juicy peach from our CSA with Breyer’s vanilla ice cream and cinnamon. It was absolute heaven. Obsessed with this tie camo tee (on sale for $11.98, I’m wearing XS for reference) paired with ripped black jeans, tortoise hoop earrings(also love these), and my new favorite cut out flats from Target. This is the real, more expensive (and better quality) version from Free People. Can you tell I love camo? The black jeans I wear like every day, camo tee (similar, also love this studded one), platform sandals (black is still available), and saddle bag. Also, my favorite cardigan in oatmeal is half off! I have it in black, too (sold out) and it’s the comfiest thing ever. See you tomorrow for an epic recipe! Aren’t they so yummy and refreshing?! Hehehe I love me some toppings! Thank you for your comment about fruit and sugar! Instagram’s obsession with fruit-free smoothies made me feel so guilty for eating fruit that I didn’t eat any fruit for a few months and it was terrible! I love fruit and my life is so much better when I can enjoy it whenever I want :) Not to mention it’s so frustrating when healthy, easily accessible foods are shunned by “wellness experts” because it’s confusing and puts “health” out of reach for so many people! Anyway, end rant, but I’ve got all the praise hands up for your advocacy of fruit! You.are.killing.me! I want all of your clothes! I really am considering those tarjay booties…. Girrrll, all of this looks fab! I had Vans waffles this morning, one with maple caramel almond butter + grapes + Chobani squeeze yogurt and one with tahini + bluebz + same yogurt over wilted spinach. Yum yum. Your outfits are always so on point. I love camo too! Hope you have a beautiful day! okay THANK YOU for saying that about fruit!!!! I actually was signed with an agency a million years ago (that I left after a very brief period of time) and the woman who ran it told me I wasn’t allowed to eat more than one piece of fruit a day. I was like wait, would you rather have me eat a bar of chocolate or have an apple? it was insane. Everything in moderation!! p.s. I’m adding those gorgeous flats to my bday wishlist!! I love those target flats! Just curious, are the ones you are wearing the cognac or tan color? The tan look much lighter in the photo than on the website, and if they are indeed lighter, I may have to get that pair too! Tan! No clue why they look like cognac online. Weird! In the end, the country is still angry and upset over Casey Anthony and I.J. Yummie….the recipes look amazing. This sounds really delicious! There are some people in my family that would enjoy it. You will have for free by playing for entertaining. will be renowned, duue to its qualiy contents.